Arsenic and Old Space: A Key to Life on Other Planets? Has Obama's NASA Strategy Fizzled at Launch? The Web has been percolating for a couple of days now about a hush-hush NASA press conference scheduled for Thursday afternoon about a major discovery in the field of astrobiology  the search for life on other planets. "Has NASA Found Life Near Saturn?" asked the Atlanta Journal-Constitution. "Has NASA Found Alien Life?" wondered PC Magazine. Well, no, and it's unfortunate that all of this nonsense has been out there, because the real story is important enough without the hype. What a team of scientists actually found, as described in a paper in Science, is what may be the oddest bacteria on Earth. 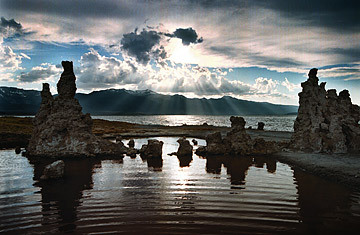 These microbes live in hellish conditions in Mono Lake, a super-salty, alkaline, arsenic-rich body of water in eastern California that would be toxic to most organisms. But the new bug doesn't just thrive here: it uses arsenic in place of the standard phosphorus as a building block for its internal proteins and even its DNA  and nothing like that has ever been seen before. Bacteria are known to live in some pretty harsh conditions  boiling springs in Yellowstone National Park, encased in solid rock a mile underground, in pools of radioactive water  but this creature represents a true biological alternate reality. That's a big deal in any case, revealing how much we have yet to understand about nature's astonishing capacity for improvisation. But the astrobiology connection just raises the stakes. Scientists who hope to discover alien life someday have always had to concentrate on life as we know it  because after all, if we don't know it, how can we know where and how to look? It's never been shown that other kinds of life are impossible, though. For decades, for example, biologists have wondered if silicon could take the place of carbon, the basis of all life on Earth, in forming self-reproducing, information-carrying molecules like DNA. Indeed, Arizona State University physicist Paul Davies, a co-author of the Science paper, has argued for some time that life as we don't know it might exist, as a sort of "shadow biosphere," even here on Earth. This discovery proves that it isn't just wild speculation. And if alternate biologies can happen here, there's no reason to think they can't happen elsewhere  not only like the newly discovered bacteria, but all sorts of takes on what life might look like. If so, it's great news for astrobiologists: the more variety out there, the more places you can go looking for aliens. "We've cracked open the door for what's possible for life in the universe, and that's profound," says lead author Felisa Wolfe-Simon of the NASA Astrobiology Institute and the U.S. Geological Survey. "What else might we find?" See "Listening for Aliens: What Would E.T. Do?"